Back to the drawing board. 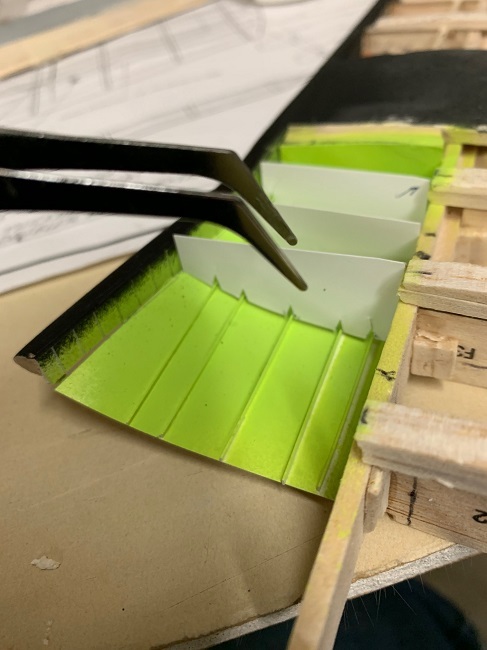 This time, I took the added precautions of cutting out my profile drawing and trial-fitting it inside the fuselage with the canopy temporarily taped down. You can just barely see the outlines of the pilot's seat and head rest. This way, I could better ascertain their locations, and from there, the rest of the details as well. Now I had to redraw all of the side wall details, including the pilot's seat, to their new locations. 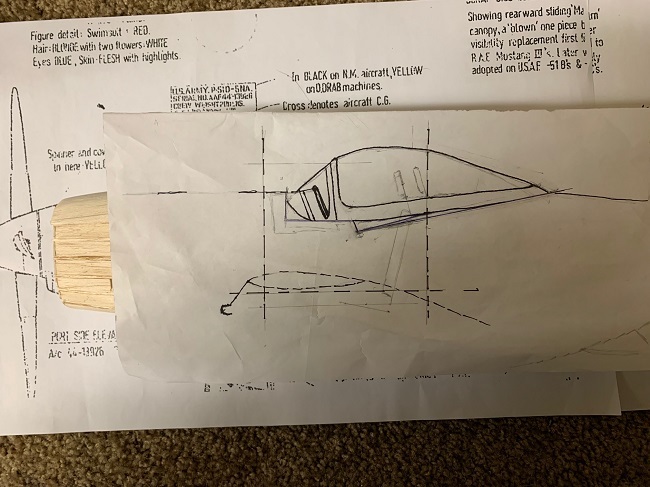 This drawing was repeatedly inserted within the balsa fuselage several times to ascertain I was getting everything in order. That's when it dawned on me that the "dip" was the source of my troubles. For some reason, it doesn't match up with the CAD inboard profile drawings and it didn't match up with the drawings of the Mustang. 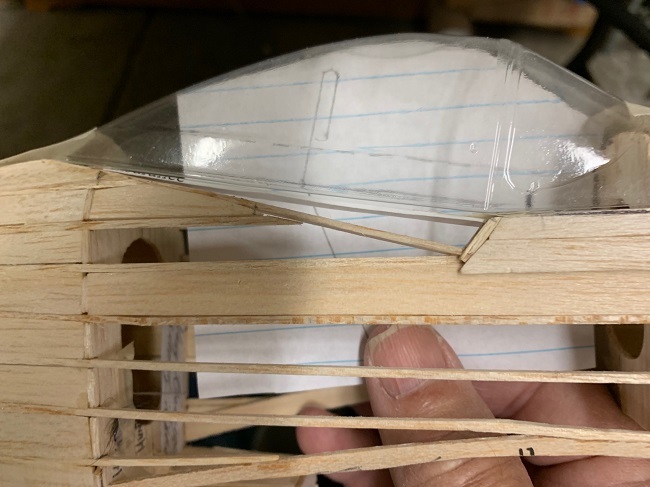 I carefully cut out a strip of cardboard paper and placed it along the canopy "rails" of the balsa fuselage. That was my problem. It was after I placed the strip of paper along the canopy outlines that it finally made sense. Now I had to redraw all of the interior detailing to their new locations. That's exactly my intentions as well. At least for now, that is. Things have a way of either working out or interferring. I figured the "drop in" cockpit route might be the way to go. Only issue, is how to fit the vertically detailed side walls to conform to the curved outer skin of the fuselage. Or at least fit the cockpit in such a way that it will drop in and still be tight around the boundaries. I would definitely detail and install the floor area first. 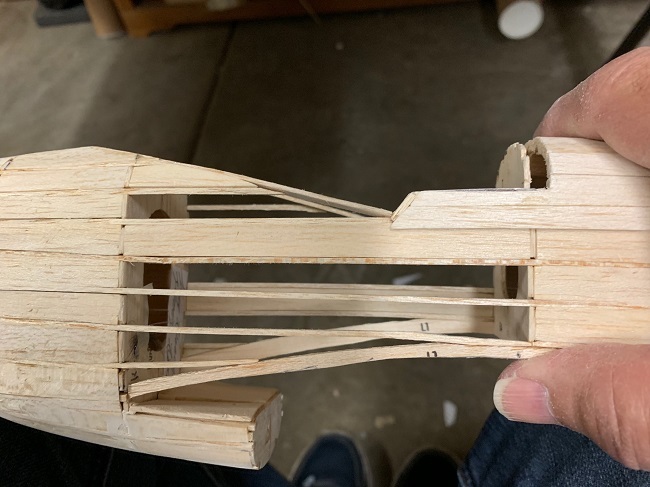 I'm at the point of trying to determine the exact location of the seat so I can detail the foot runners up to the rudder pedals. From there, I can also detail the side walls such that the controls and their locations in relationship to the seat would make sense and look like they are all in proper perspective. From there, I'm thinking I would (initially) detail the side walls separately, then fit them in one at a time. It might be easier that way. To go the "drop box" route, I'd also have to take into consideration of the main instrument shroud. The last items would be the seat and control column. Because the pilot's seat sticks out above the fuselage decking, I'll probably have to wait until just before installing the canopy, which means the fuselage itself would have to be detailed and finished first. Lots of "what if's" going through my mind and lots of mental energy spent on planning far ahead. That's also what happened when I super detailed the S.E.5. The Mustang really takes this level of planning to another level. Gary...when I used to build plastic models and detail the cockpits, I'd build a cockpit bucket with detachable sides from the floor. Detail the sides and the floor separately with the seat detail and anything behind the seat detailed with the floor then slip the side into the fuselage and button it up with the floor. You've probably already figured this out yourself...but that's the way I attack the cockpit! From there, preliminary drawings of the cockpit inboard profile were made, both right side view and left. i also included the wing saddle of the fuselage to see exactly how far downward I could add the cockpit floor. Turned out I had just about 1/8" left. 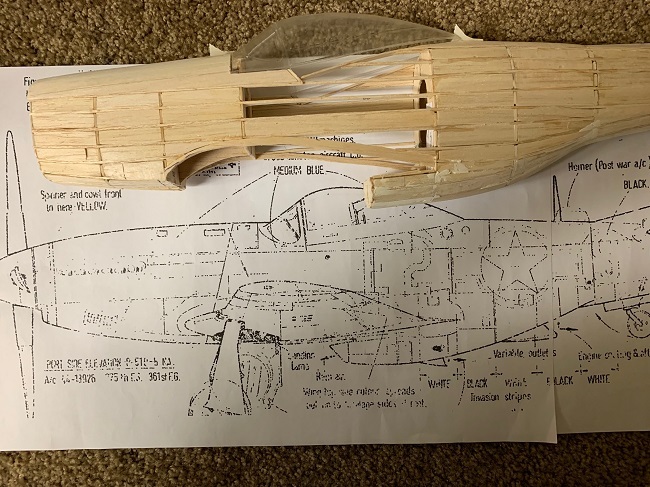 To be sure, I laid the balsa fuselage over the scale drawings of a "D" variant Mustang that I've been using as reference. Admittedly this is a simplification of replication to scale, but it works for me in my humble apartment. No CADs, no gimmicks. It should work, right? I even took into account that little "dip" on the structural framework. To begin with, I needed to compare the profiles of the CAD drawings with those of details shown in the picture for the left side and use them as a reference for my scale to Guillow's Mustang. 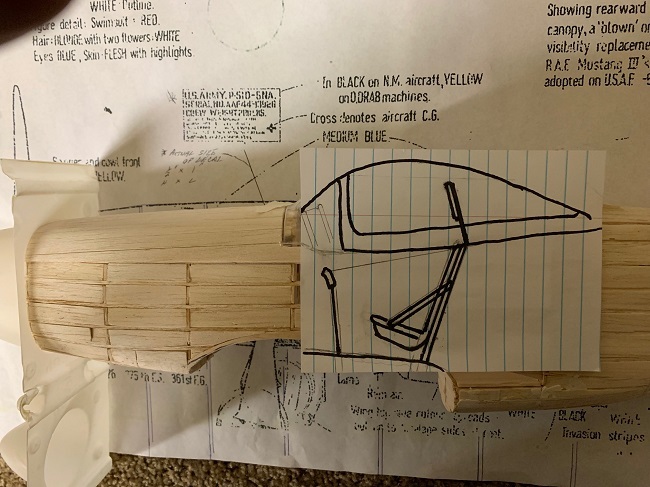 I used a combination of the lower canopy frame, with what I interpreted to be the yellow-colored fuselage structural frame, and the skeletal structure of the balsa fuselage. I figured it was going to be easy to simply follow the outlines of the yellow lines as they seem to have that "dip" which suggested a good reference point. So, I started using them but after about 3 different trials, nothing seemed to go right. 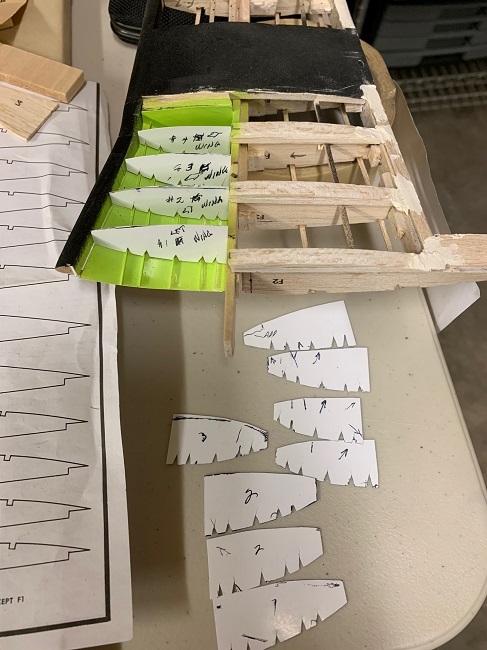 The components to the side details were not matching to either the balsa fuselage or vice versa. Something wasn't right. Sky9, thank you for those words of encouragement. They're much needed here. It's challenging to say the least. For the R/C types of 1/5th scale or larger, they have ready-made aftermarket cockpit interiors that I've seen are incredible. Initially, I thought they would look phony with all-plastic details and literally everything molded together to create a mess. Not so! They really show a tremendous amount of fine detail and when done right, it's almost difficult to tell the differencre between the model and the real thing. Funny, in the plastic models, which is much smaller in scale than the 1/15th Guillow's Mustang and on the opposite end of the modeling world, they too, have ready-made aftermarket accessories to super detail their own cockpit interiors with extremely detailed photo-etched brass, resin parts, metal fittings and more. Here I am, sitting between the two extremes and have to scratch out just about everything. It's always a challenge to replicate something to scale...Skye! For me you've shown tremendous skill in showing what can be shown within reason for the scale that is being built. Size is always a limiting factor for replicating details. Your finding a very acceptable balance! Thanks for your dedication to authenticity! To begin the cockpit detailing requires more research... Sometimes this part of the build just doesn't end. I'd thought you might like to see what I'm up against and part of the reason why I was trying to avoid the detailing the cockpit interior in the first place. When I first truly had a chance to study the interior, I said to myself "Ya gotta be kidding!" My first reaction was to just stick a picture of the main instrument panel on the face board, close up the cockpit and be done with it. 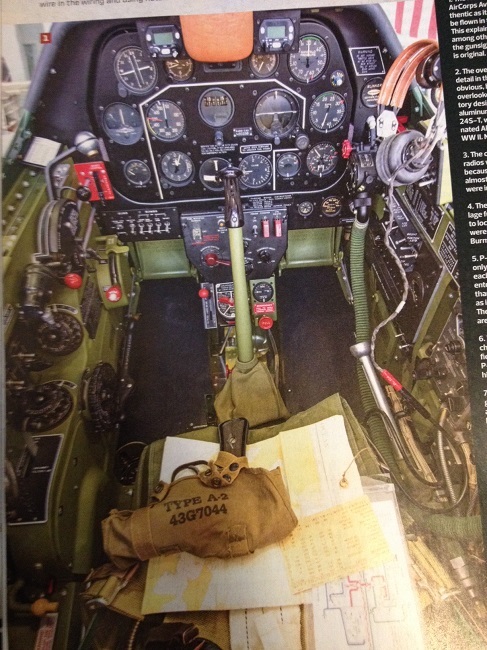 The first picture is a "typical" D variant Mustang interior. 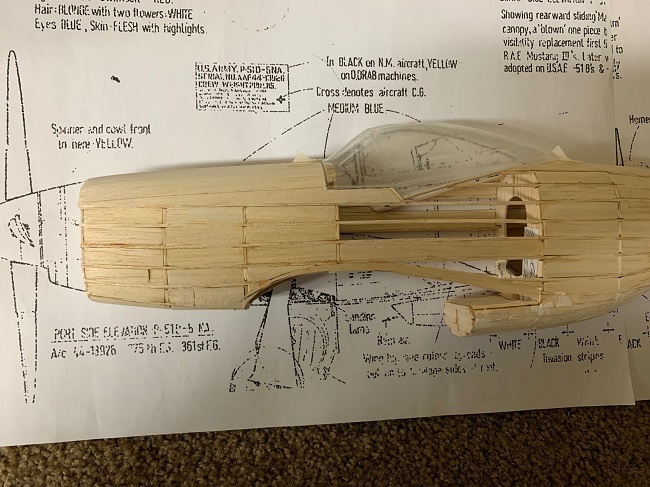 You can easily see that to create something even close to this picture in all its complexity from scratch with no readily available pieces or components that can be purchased from an aftermarket source (and sorry, I can't afford 3-D printing) can be daunting at best. Regards to 3-D printing, sometimes it really works great and other times, I've seen the results look like a complex multi-component accessory molded into one piece that looks like well, cheap plastic. I'm sure I'll get some reaction on this one. What I needed was some place to start. The best way (for me anyway) has always been with an inboard profile drawing, preferably all four sides, if you include an overview. I can easily see how everything goes together and the important part? Is the perspective of each component as it relates to its place and size to one another. The second picture shows my previously depicted CAD drawing. This is fantastic. If you stare at it long enough, things actually start to make sense, especially when compared to the first photograph. However, inboard profiles and photographs can be an illusion as I was quickly to discover (at least before it was too late). The third picture shows the same left side wall as the CAD outline with the added dimension of how the side wall really looks. You can easily see that it is definitely NOT just a plain sided wall with the accessories bolted to it. The side wall has nooks, crannies, vertical supports and more. In this case, it really shows that the throttle quadrant is "nestled" within the nook as opposed to simply sticking out on its own. If you look at the first photograph of the whole interior and compare it to the third picture, you can appreciate how such an illusion takes place. I'm now researching all of the details for the stenciling too. If I make any progress and actually start cutting wood or paper to start the cockpit, you'll be the first to know. Every time I think I've got it all, something new pops up and puts me back to the starting gate. I feel your pain when it comes to the cockpit.... If you're still serious about actually connecting the cockpit controls to the flying surfaces, you've got my respect. Biplane Guy (Keith) does it all the time, but off the dining room table. Gary - You are welcome and very glad to be able to help. Getting those small but necessary details in mind helps with the path to success and completion. Your assessment of nearly everything revolving around the cockpit is spot on and is exactly what is happening to my Marcoux Bromberg project. Working through the wing rib design and the actuating cable layout sends me back to the cockpit for connections. Your progress is terrific and am watching with great anticipation. If I can be of any other help, you know where to find me, write any time, I'm always there. Ever have one of those moments when all of the careful planning and exquisite details being laid in place to your modeling project, when all of a sudden, a fellow member offers some decals and suggestions and ... Blam! Everything comes to a screeching halt. Just had one the other day and now will have to focus on the cockpit interior in order that the rest of the model can be completed. 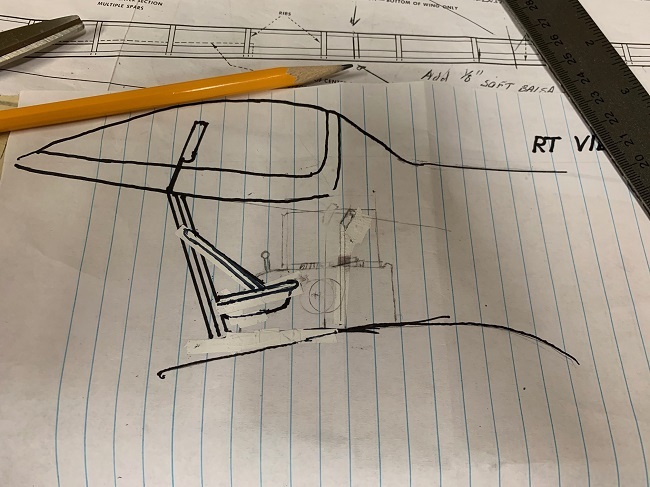 My Mustang is being built in a manner that I can't finish off one portion of the plane without first implementing and fabricating a small part, a small portion, a small detail and absolutely has to be finished beforehand. If it hadn't been for our fellow member Mike, whom I shall forever be grateful, I wouldn't have thought of the missing links and steps needed to take. Thank you Mike! Jumping way ahead of the actual construction into a conceptual representation, I believe this next picture best exemplifies my dilemma insofar as maintaining some kind of support for the excess underside skin of the fragile lamination of paper and foil representing the wheel well outline, and will be resistant to such rubbing hand handlng during my attempts to detail the interior. 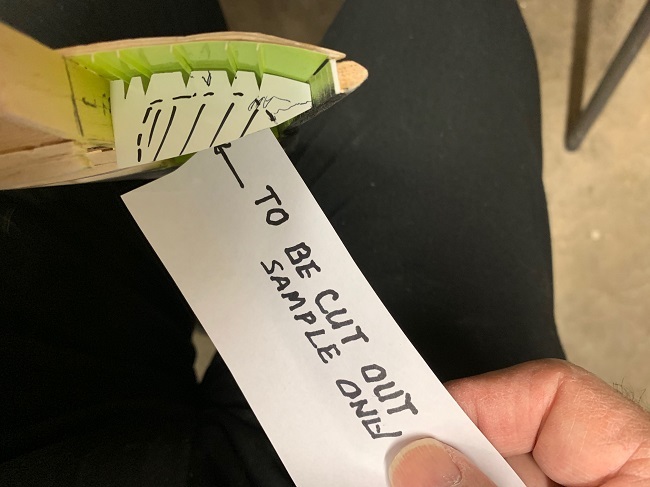 Although slighly inaccurate, this method does offer a reasonable amount of security of holding the edges of the outlines. As mentioned in my previous postings, since I installed the stringers in the "ceiling" that covers the whole interior, I have options as to exactly where to place the outline cutouts. It's with this in mind, that I'm contemplating to just add the interior detailing such as plumbing, electrical wiring and linkages prior to covering the wheel well area with the underside skin wheel that includes the wheel well outlines. I could probably make extensive use of tweezers and toothpicks but I'm sure that there will be certain details that just requires my oversized thumbs, which would pose a risk to damaging the outer skin, should I install it first. 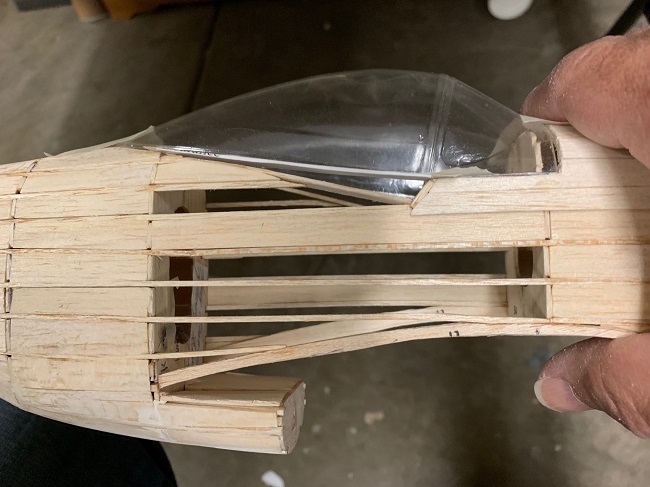 I'm going to show the "lath and sand" method described by Neil to illustrate the efforts of increasing the depth of the undersides of the wing to go from flat to a curved surface. This is a side profile view and I think it best illustrates my deviation from the Guillow's Clark Y flat surface very well. The curved surface will also slighly increase as it gets closer to the wing root, which really helps me to add more interior detail. 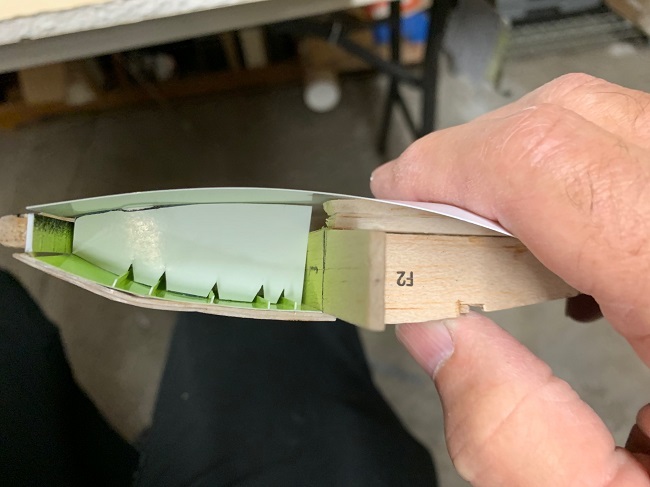 For our more astute members who may noticed the traiing edge's abrupt end, rather than a slow taper, it's because the flaps and ailerons are not installed. The blunt ends represents the trailing edge of the wing as it meets the rounded leading edges of the flying control surfaces. The fourth pictures # 20 shows best my attempts to add the templates of the faux supports. 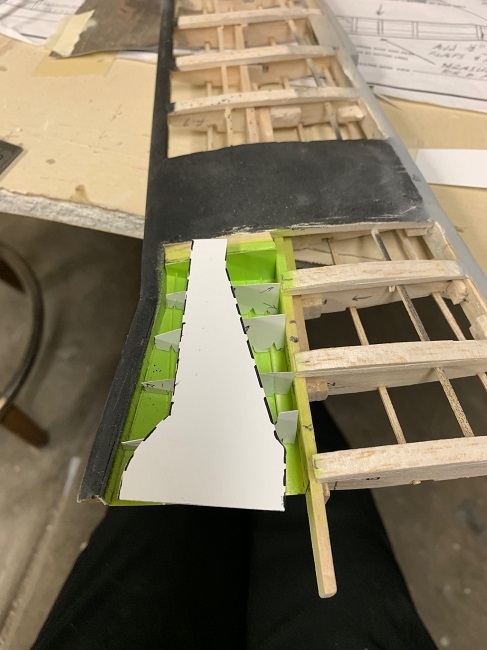 The supports themselves will be refined to a more accurate profile seen on some of the previous interior photos of the real aircraft wheel well interiors. 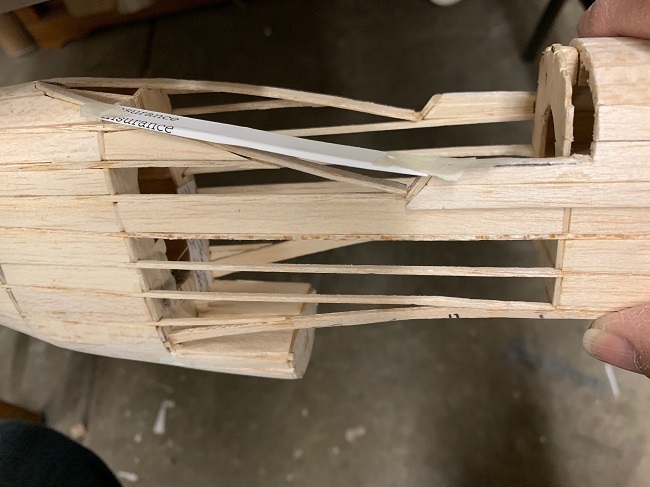 It also shows how I had to cut and re-cut several of these faux ribs to get it "jes' right and tight" as the tolerances are extremely close between the underside skin, the wheel well outlines and the interiors. 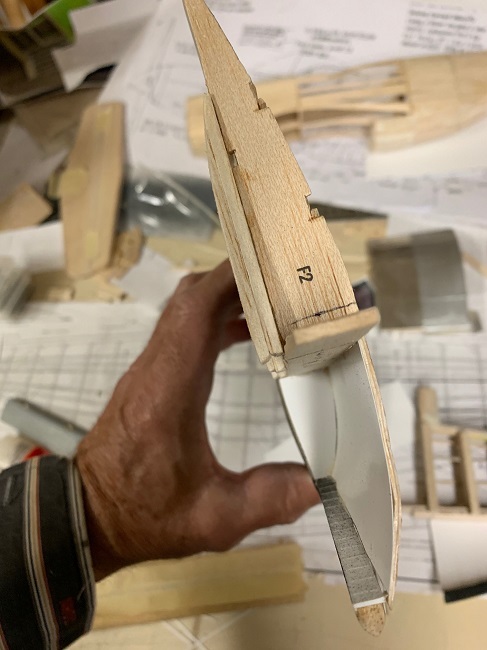 The last picture, you can see the challenge of me trying to maintain the slight increase in curvature of the underside of the wing with the potential wheel well cutouts (laid on top) and see how the issue of trying to balance everything comes into play. On my next series of posts, I'm going to jump ahead of myself to best illustrate the challenges that I'll be facing.